If you’re from the upper North Island, the name Allan Cameron should be instantly recognisable, him being a successful contractor with a long-standing pedigree in large-scale earthmoving and civil engineering projects. As Cameron was carving a more-than-enviable niche in his industry of choice, the mechanical side of heavy equipment was an area that he paid special attention to, especially when it came to making machinery more efficient to use and cost-effective to own. 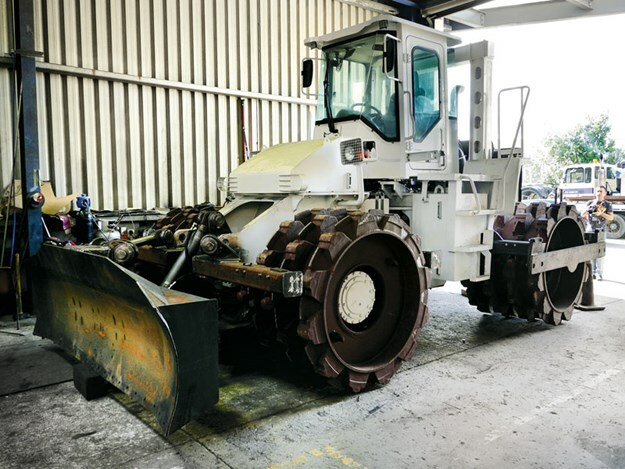 The culmination of this experience and many years of innovation is the reason we are taking a look at the latest 20-tonne Pacific Cameron PC20-2 compactor being assembled at the BS Engineering workshop in Auckland. Encompassing a few design upgrades over its predecessor the CC20, it is sure to gain the attention of those in the heavy compaction market. To the untrained or inexperienced eye the Pacific Cameron PC20-2 may appear to be much like any other heavy-duty soil compactor, but the thought and engineering innovation behind the Down Under-built piece of machinery belie all outward appearances, and prospective buyers need to take serious note. "I started down this path a few years ago where we worked on improving the Caterpillar 815 and 825s we were using on civil engineering work," Cameron says. "We put some of my earlier ideas into a number of second hand units and as word got out, we began selling them, eventually to around six countries." Cameron says the next obvious move was across to new machinery, and Hyundai compactors were modified with design enhancements and sold with new-machine warranties. "We continued refining the ideas, and over the past few years it has led to where we wanted to be, which was building our own machines and to our specifications," he says. "It has given our Pacific Cameron machines a strong point of difference by providing faster, concise and effective compaction, which in turn has lessened fuel burn by some 19 per cent when compared with similar machines from other manufacturers." There are a number of differences that make the Pacific brand of compactor stand out from the crowd and these should be quickly noticeable to experienced operators, not only visually but from the feel of the machine when in use. The most outwardly noticeable change for many would be the wheels, or drums as they are usually called. Pacific Cameron compactors run four rows of feet per drum on the rear and three rows on the front, as opposed to the industry norm, which is up to five rows on both drums. With the feet being offset between front and rear drums (and some cleverly calculated weight distribution), even compaction is achieved, and with less ground-contact drag, associated fuel burn is reduced, says Cameron. "We have a lot less drag than our competitors—like more than 40 per cent less." However, some may ask whether having fewer feet in contact with the ground means not as much fill is being compacted. Cameron addresses this point with an explanation of the high ground pressure compression cap that sits atop each foot. "These caps add double the pressure as the foot enters the fill, then it balances out as the drum rotates with the machine moving forward, so as the fill tightens up at the finishing stage, the caps do their job again, providing a tight finish," he says. The development of leading-edge equipment such as what we’ve seen with the Pacific Cameron PC20-2 compactor is innovative design and construction at its finest. It is certainly a piece of equipment more New Zealand and Australian companies should be looking to.